Wellesley College’s Julie Matthaei was among 600 academic economists who signed a petition supporting a minimum-wage increase, a position attacked in a full-page NewYork Times ad. But she was stunned recently when this description was used against her in a full-page advertisement in The New York Times by a murky pro-business group opposed to raising the minimum wage. Matthaei was among 600 academic economists who signed a petition supporting a minimum-wage increase, which the ad tried to discredit. This flashback to the Cold War is among the signs that the minimum wage, which President Obama wants to raise to $10.10 an hour, has become a wedge issue in an election year in which the control of Congress is at stake. Democrats have adopted a higher minimum wage as a populist appeal to lower- and middle- income families, who have watched the benefits of the recovery accrue to the wealthy, while many Republicans have attacked it as a jobs killer that would hurt small businesses. Economists supporting a minimum-wage increase also include six Nobel Prize winners, of which the ad made no mention. It is unclear who is funding the Employment Policies Institute; research director Michael Saltsman declined to name the businesses, foundations, and individuals who are major donors. But Saltsman denied any “red-baiting,” noting that the description of Matthaei comes directly from her Wellesley Web page. 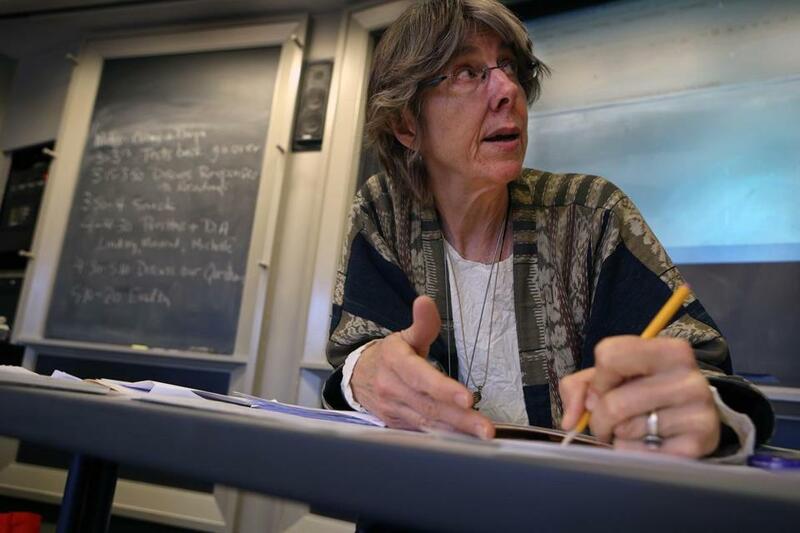 Matthaei, 62, earned her master’s and doctorate in economics from Yale University in 1978. She later authored an award-winning academic book, “An Economic History of Women in America: Women’s Work, the Sexual Division of Labor, and the Development of Capitalism,” published in 1982. She has taught feminist economics at Wellesley, as well as courses in Marxist and post-Marxist economics, to thousands of students while raising concerns about climate change, racism, sexism, and economic inequality. She likened attempts to vilify her as similar to tactics used to discredit Obama and cast him as a socialist because of his efforts to create a system for universal health care. Karl Marx’s criticisms of capitalism still have resonance today, she said, noting high unemployment, increased concentration of wealth, the erosion of the middle class, and entrenched poverty among low-income families. She also pointed to complex speculation and financial instruments, such as derivatives, that in recent years helped the rich get richer at the expense of the broader economy. “These types of speculative transactions are bad and make the economy unstable and contributed to our crash in 2008,” she said. The daughter of a wealthy Republican who owned an auto parts company, Matthaei grew up outside Detroit. She protested the Vietnam War while attending Stanford University, got arrested, and in her own words “never grew out of it” or changed her radical beliefs. She added that she had the luxury of studying alternative economics because her father paid for her education and provided a monthly stipend, an opportunity many never get. Today, she is cofounder of the US Solidarity Economy Network, which promotes “social welfare over profits and the unfettered rule of the market,” and a member of the Union for Radical Political Economics, a group that studies, analyzes, and helps construct progressive social policies. The battle over the minimum wage is taking place at the state and federal levels. Obama has proposed a federal increase to $10.10 from $7.25 an hour by 2016, but House Republicans have blocked it. In Massachusetts, legislators are considering a proposal to raise the state’s minimum wage to $10.50 from $8 per hour. A ballot question proposed for the November election would make a similar increase. More than 70 percent of Americans in a poll last year supported a minimum-wage increase, although it would directly benefit only a small share of workers, Matthaei said. She said she still supports replacing capitalism with what she believes would be a more humane, egalitarian system that would guarantee an individual’s right to basic things like food, health care, and a job. Such guarantees, she said, were included in a universal declaration of human rights written in 1948 by a committee that was chaired by Eleanor Roosevelt, the wife of President Franklin D. Roosevelt. “I guess she was a socialist, too,” Matthaei said.